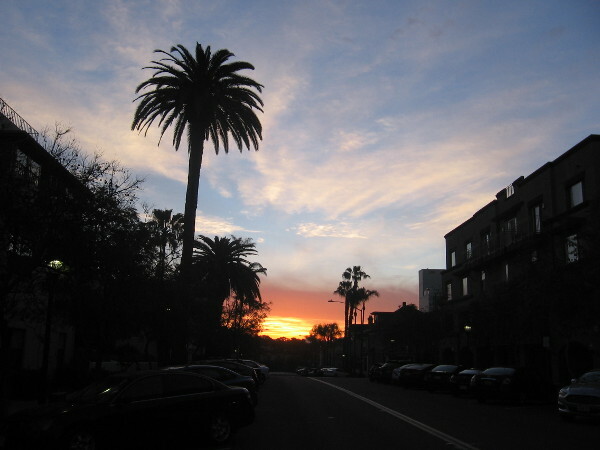 photography – Page 116 – Cool San Diego Sights! Delightful heaps of junk on a working pier. 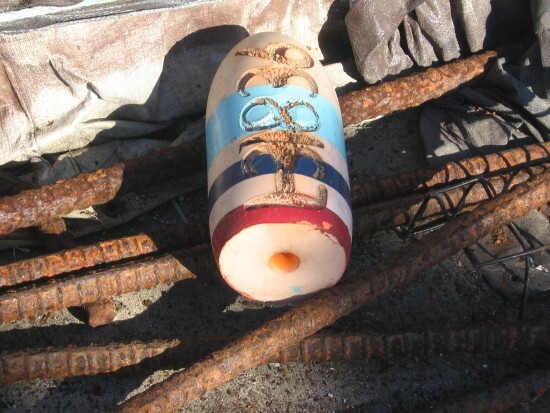 Solitary float on a pile of rusted rebar. Tuna Harbor’s G Street Pier is one of my favorite places in San Diego. The views of downtown and the bay are magnificent. There are birds for company and swaying boats on all sides. 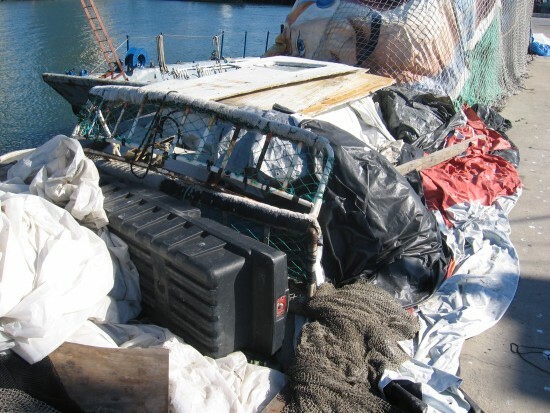 There are lobster traps stacked, nets in huge mounds, and heaps of amazing junk. 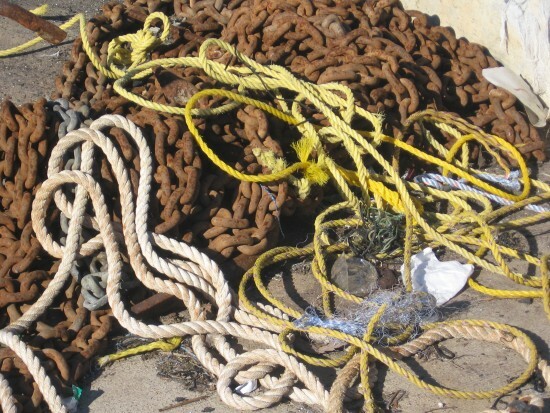 Ropes and rusted chains in a delightful tangle. 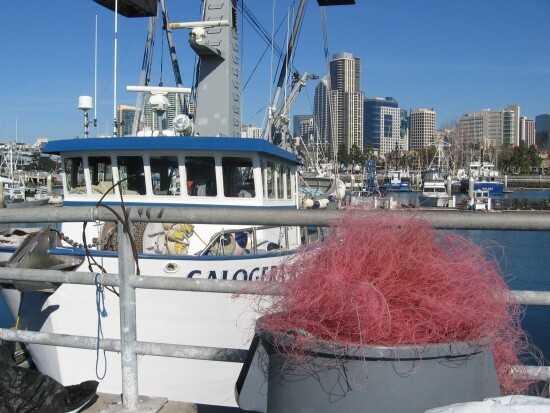 Just a bunch of junk on the Tuna Harbor pier. Looking beyond colorful garbage at boats in the harbor. 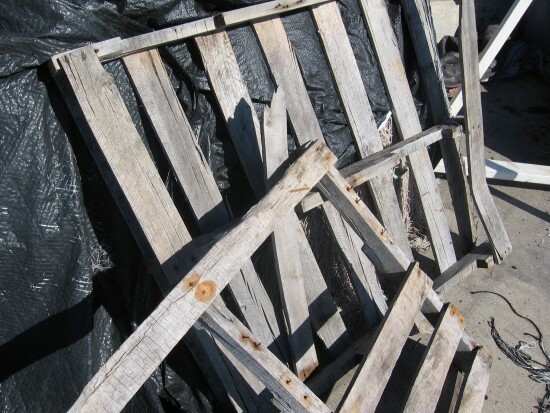 Broken pallets lean against mound of nets covered in plastic. 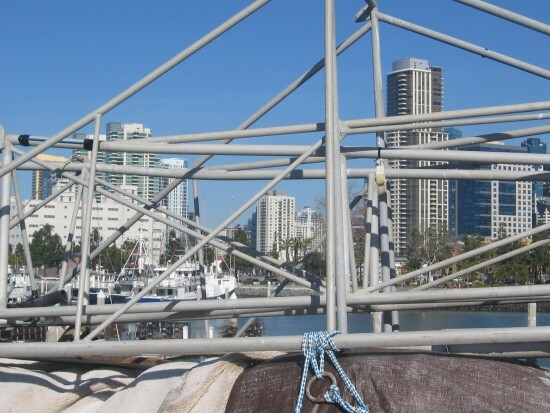 Detached boat structure on pier frames San Diego skyscrapers. Colorful floats scattered on the public pier. 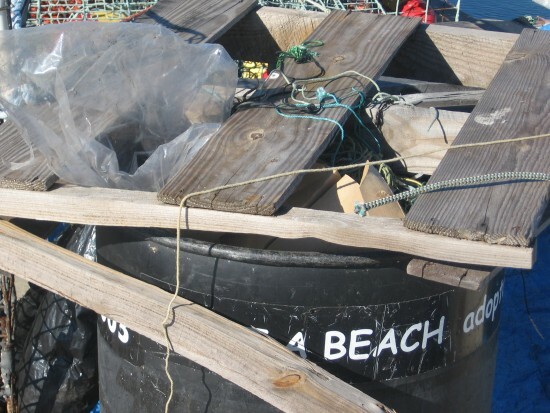 Adopt a Beach garbage can overflows on the G Street Pier. 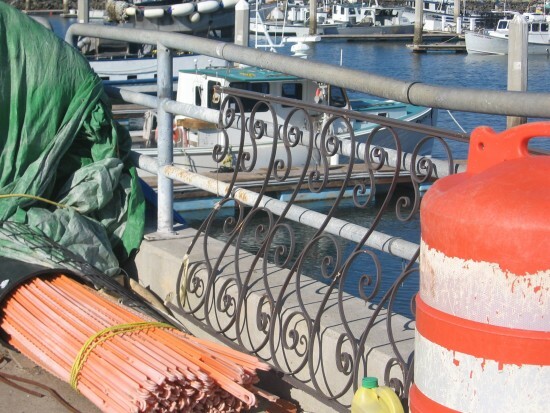 A working pier can resemble a chaotic junkyard. 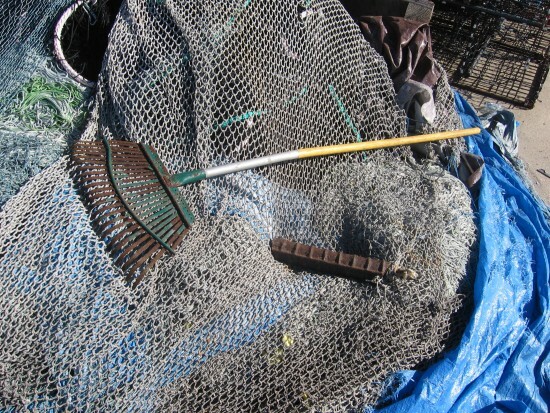 A leaf rake lies atop a ball of nets and ropes. 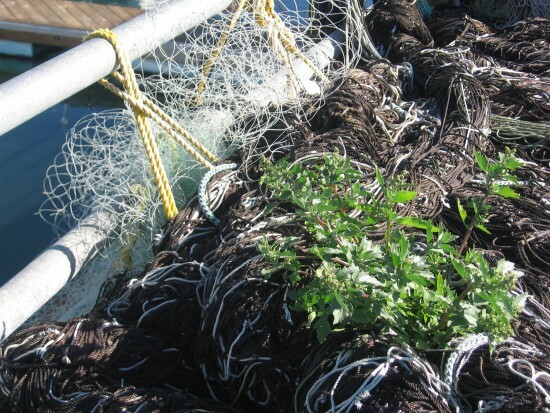 A large weed grows out of a small hill of old nets. 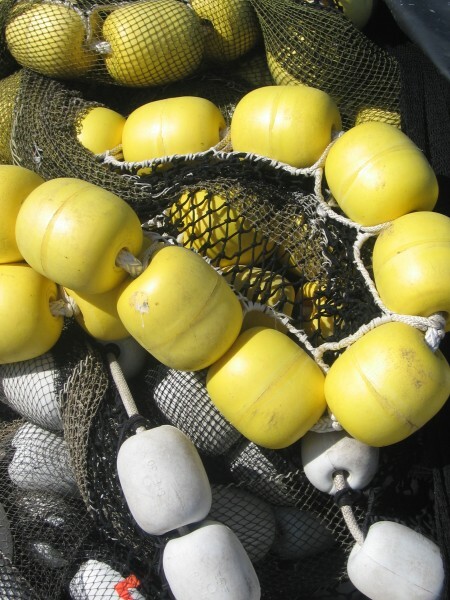 A beautiful image of sinuous yellow floats on a seine net. 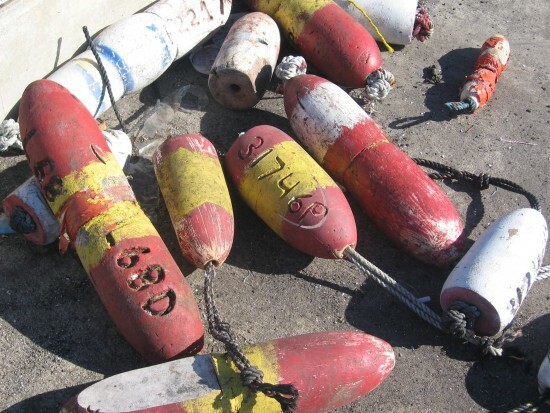 Posted on January 2, 2014 August 23, 2015 Tags amazing, boats, color, fishing, junk, photography, piers, san diego, san diego bay, tuna harborLeave a comment on Delightful heaps of junk on a working pier. History at Horton Plaza Park construction site. North part of the Horton Plaza Park construction site behind fence. A large area between Broadway and the Horton Plaza shopping mall is fenced off for construction. One end of the downtown mall has already been demolished and leveled to the bare ground. 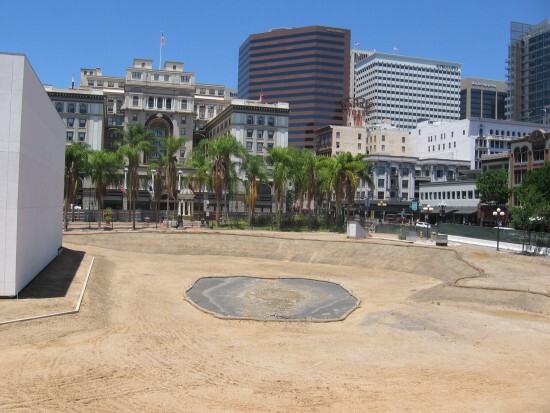 The long-neglected Horton Plaza Park is being enlarged! On the fence surrounding the construction site are a number of interesting old photographs showing the park’s history. When real estate developer Alonzo Horton built the Horton House hotel (now the U.S. Grant Hotel) in his “New Town” in 1870, he included a small plaza on the hotel grounds. 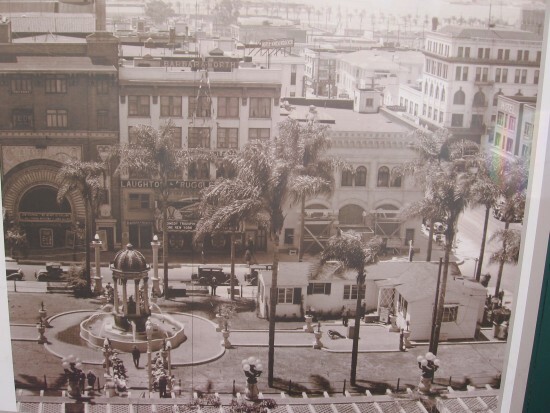 In 1895 he sold the half block plaza to the growing city of San Diego, stating his objective was “to provide a central, commodious and attractive place for public meetings, public announcements, public recreation and for any other proper public purposes, a place where all public questions might be discussed with comfort, where public open-air concerts might be given, where the people might rest, and where children might play in safety.” In 1909 the first fountain in the United States to feature electric lights was installed in the park. Over the years, the small park has seen a whole lot of history, as the following photographs at today’s construction site demonstrate. 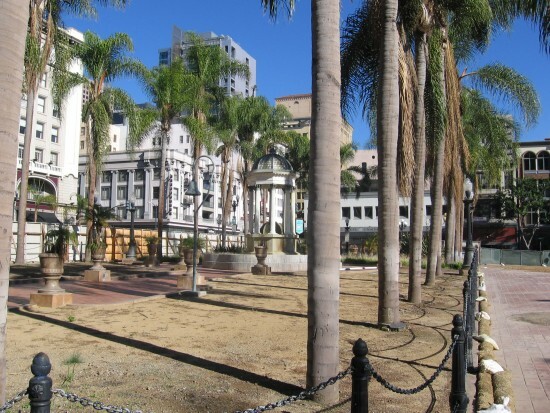 Horton Plaza Park was designated a historical landmark by the City of San Diego in 1971. Horton Plaza Park during 1935 California Pacific International Exposition. 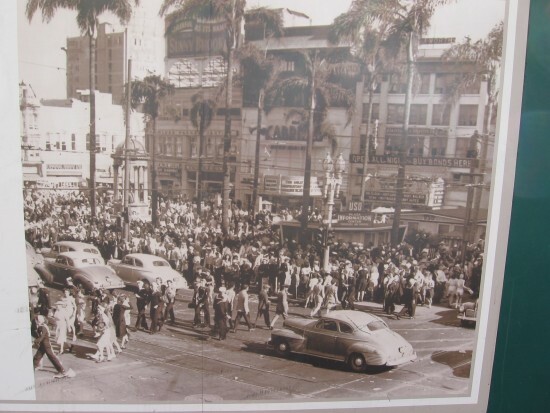 Horton Plaza Park crowded for V-J Day celebration. The streets were crowded with a spontaneous celebration when World War II finally ended. 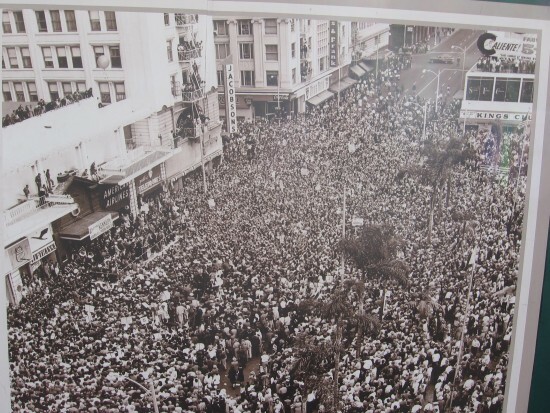 Thousands attend rally for John F. Kennedy in Horton Plaza Park. On November 2, 1960, Senator John F. Kennedy spoke at Horton Plaza Park, seeking votes in the upcoming presidential election. A huge crowd turned out. 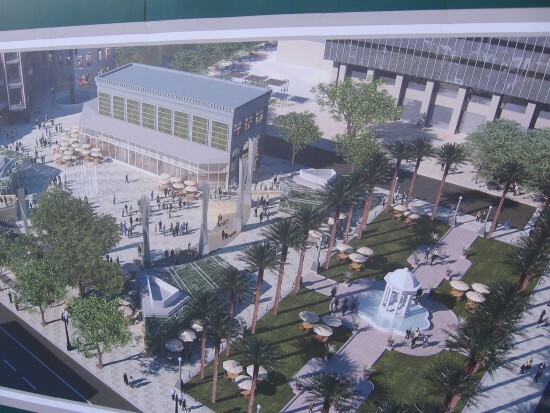 Sign shows how the new Horton Plaza Park will look at completion. The beautifully renovated park will include lots of space for public events, including outdoor concerts! A huge area has been cleared to make way for the new park. 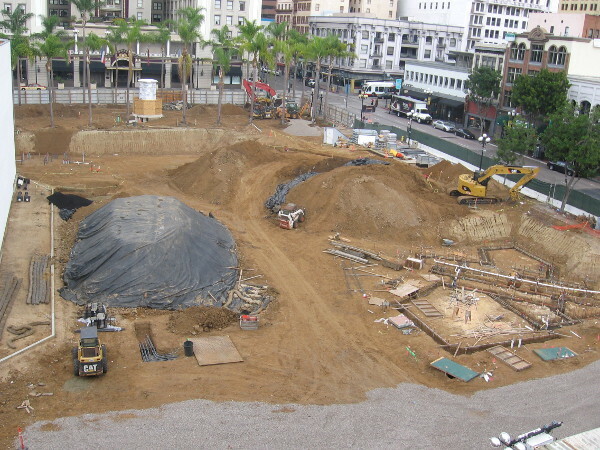 Construction of the new Horton Plaza Park is well underway in early 2015. Posted on December 24, 2013 February 2, 2015 Tags architecture, construction, downtown, history, horton plaza, parks, photography, san diego, signs, streetsLeave a comment on History at Horton Plaza Park construction site. Cool pedestrian bridge over Harbor Drive. 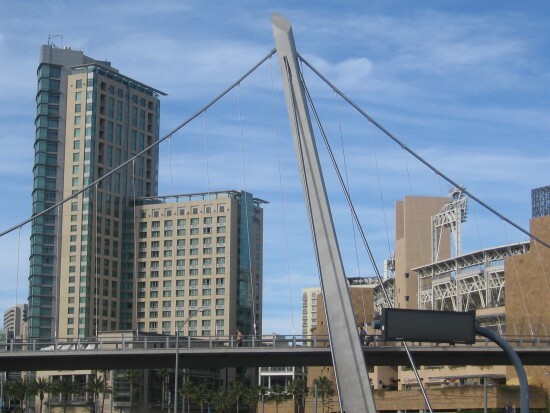 This cool new pedestrian bridge spans Harbor Drive between the San Diego Convention Center and Petco Park. 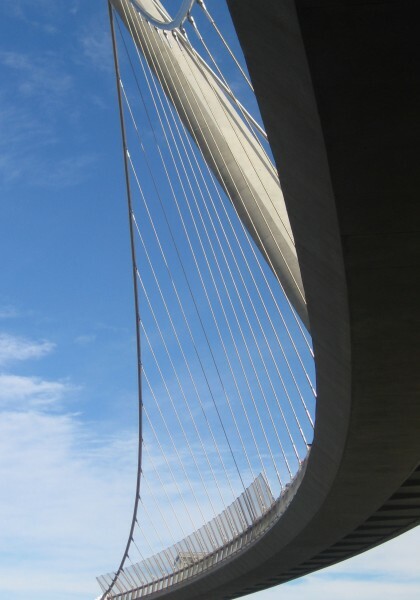 The unique suspension bridge took longer to build than anticipated. According to media reports I saw, the firm that designed it originally miscalculated how much weight it could hold! Moon rising over the cool Harbor Drive bridge. 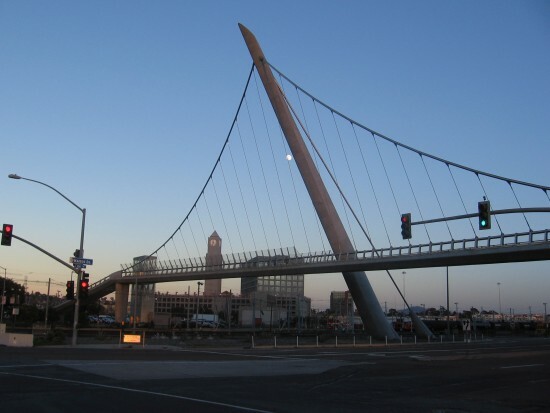 Harbor Drive pedestrian bridge, Omni Hotel and Petco Park. 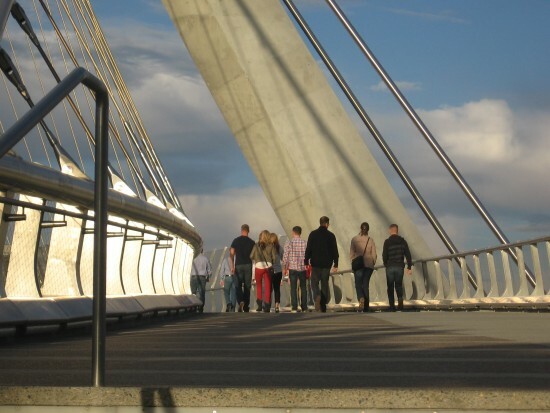 Pedestrian crosses Harbor Drive on a fantastic bridge. 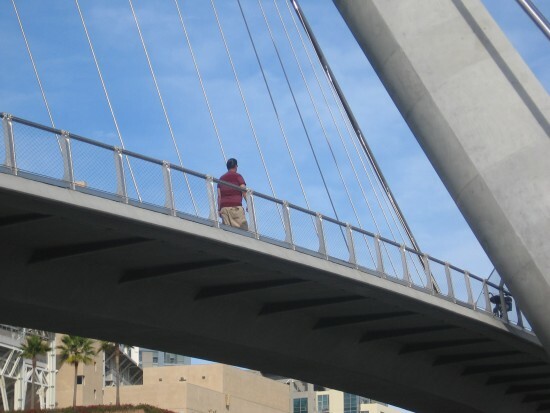 People cross the beautiful bridge in downtown San Diego. 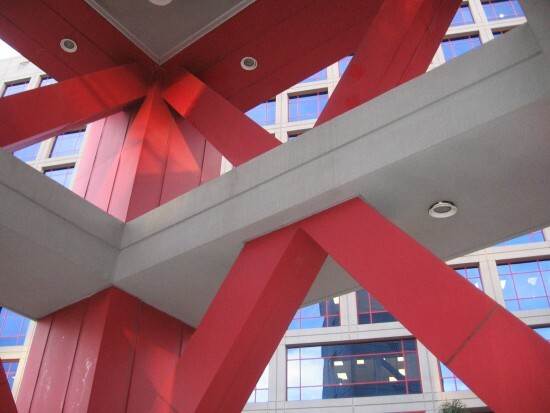 Posted on December 20, 2013 July 7, 2014 Tags architecture, bridges, cool, design, downtown, photography, san diegoLeave a comment on Cool pedestrian bridge over Harbor Drive. Clock tower at 12th and Imperial trolley station. 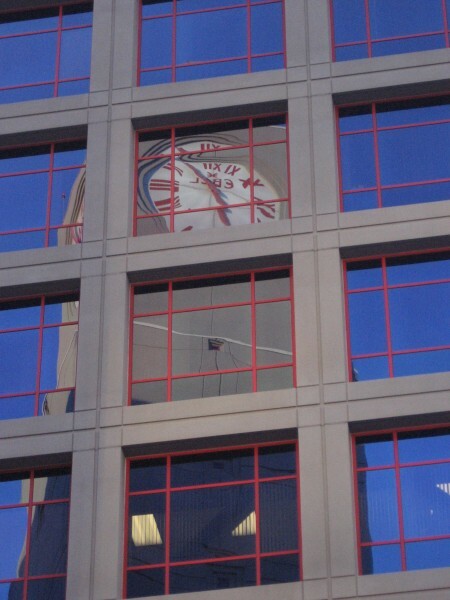 Clock tower at 12th and Imperial reflected in windows. I got some unusual photos of the clock tower that stands next to the transit center at the 12th and Imperial trolley station downtown. The clock is one cool San Diego sight that can be seen from many points in the city. Looking up the interior of the clock tower structure. You can stand inside the base of the tower and look outward! 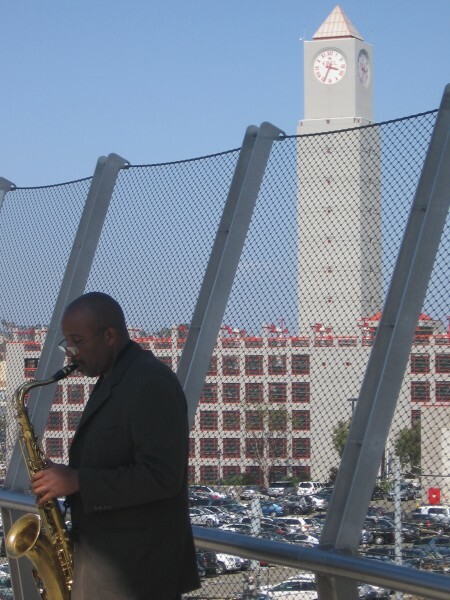 Clock tower above musician on Harbor Drive bridge. Posted on December 18, 2013 June 25, 2014 Tags architecture, buildings, clocks, cool, photography, san diego, san diego trolley, towers, trolley station, unusualLeave a comment on Clock tower at 12th and Imperial trolley station. Stunning sunrise over downtown San Diego. Blazing sunrise seen from Tweet Street park in San Diego. Check out these photographs! I captured these three amazing images early this morning. Sunrises over San Diego are often beautiful, but today the brightly painted clouds were absolutely stunning! Fiery sunrise over Cortez Hill in downtown San Diego. 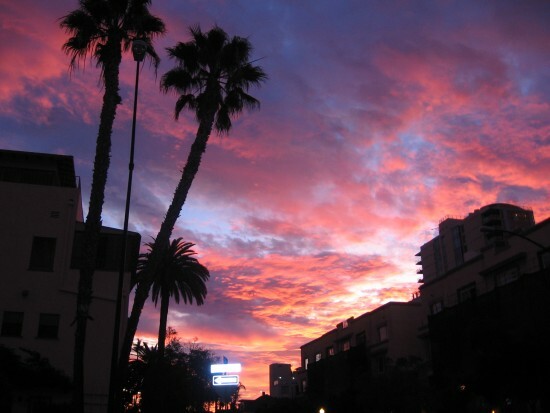 Beautiful sunrise colors clouds above El Cortez Hotel. 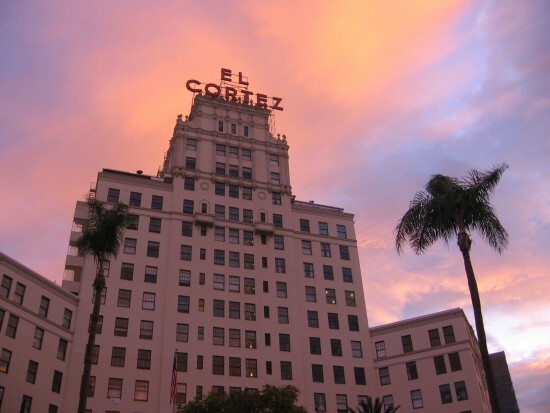 El Cortez seen from a couple blocks away early one morning at sunrise. The sun begins to rise as I take a picture on Cortez Hill. 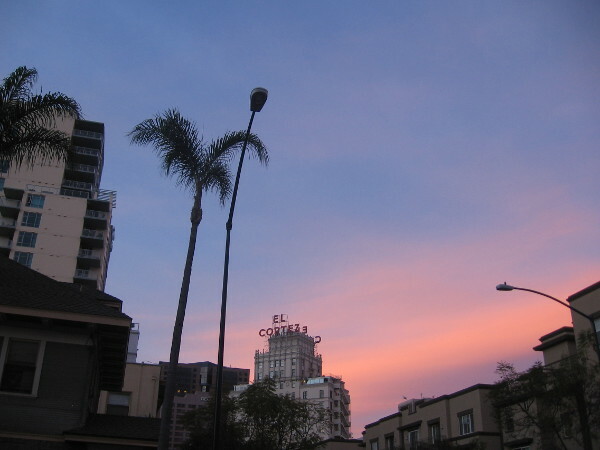 Posted on December 17, 2013 March 17, 2015 Tags beautiful, color, cortez hill, downtown, el cortez, photography, san diego, sky, sunrise, tweet streetLeave a comment on Stunning sunrise over downtown San Diego. 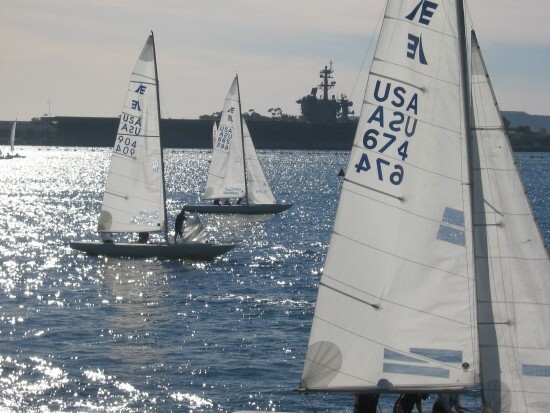 Sailboats race on shining San Diego Bay. Sailboats on shining San Diego Bay. I snapped these photos almost directly into the sun. I assumed they’d turn out lousy. But the effect is actually pretty cool! To me it looks like white sails winging through a brightly shining heavenly space! 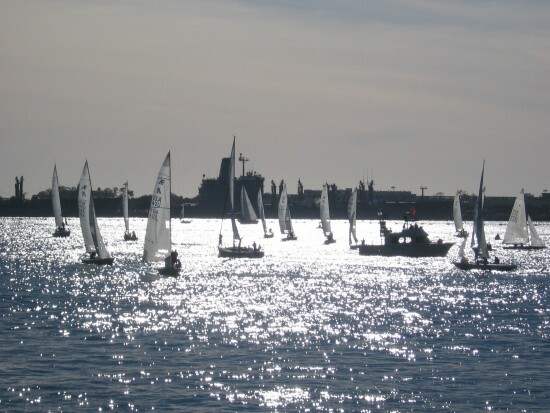 Sailboats race in a bright silvery space. Posted on December 15, 2013 December 15, 2013 Tags beautiful, beauty, cool, heaven, photography, sailboats, sailing, san diego, san diego bay, unusualLeave a comment on Sailboats race on shining San Diego Bay. UFO spotted above Rotary clock at Liberty Station. I was going through some of the photos I took while walking along the boat channel at Liberty Station. 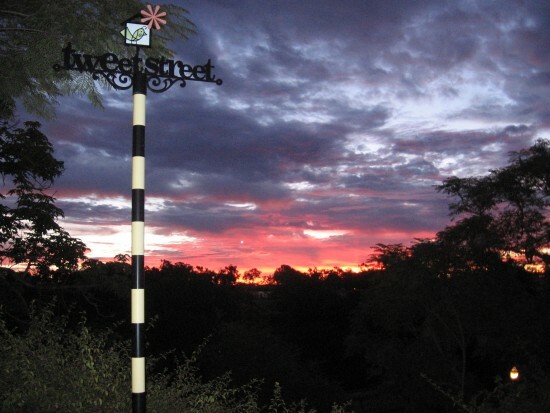 This elegant clock donated by the Rotary Club has always struck me as odd–it stands for no reason on what is essentially a nature path among palm trees. But something else seemed a bit weird in this pic. There seemed to be a small dot directly above the clock. I magnified the image and discovered a UFO! Looks to me like a distant flying saucer! I thought the strange dot might be an aircraft taking off from nearby Lindbergh Field, but it’s way too small and doesn’t look like any airplane. What is it??? It looks like a flying saucer to me! 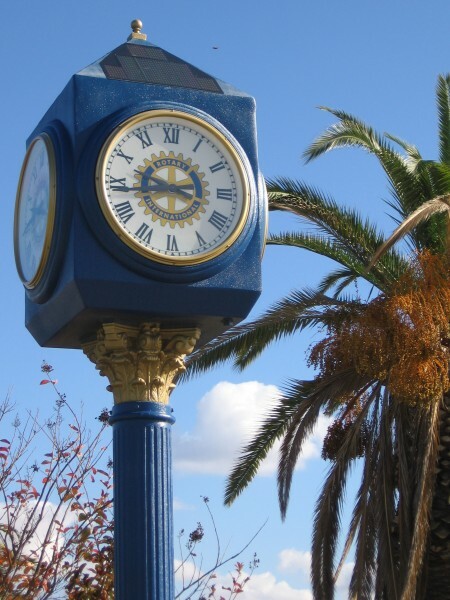 Posted on December 14, 2013 December 14, 2013 Tags clocks, flying saucers, liberty station, mysterious, paranormal, photography, strange, ufos, unusual, weird1 Comment on UFO spotted above Rotary clock at Liberty Station.